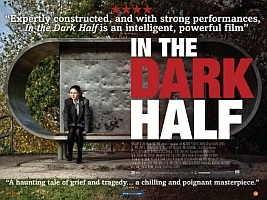 Directed by Alastair Siddons and based on a script by Lucy Catherine, In the Dark Half (2012) is a psychologically unnerving study of grief on a tender adolescent mind. Boasting a stand out performance from relative newcomer Jessica Barden, Siddons’ first narrative feature blends two quintessential British sub-genres (rural mythological horror and kitchen sink, social realism) with varying success. 15-year-old Marie (Barden) spends her days escaping the grim reality of her small suburban home by taking excursions into the ominous forest that looms behind her garden fence. Her six-year-old neighbour Sean also spends his days in this menacing woodland, often joining his reclusive father, ‘Filthy’ (Tony Curran) on his daily hunting trips. Marie spends her time burying the dead bodies of these woodland creatures in a deserted bomb shelter that she decorates with numerous spirit catchers and mythical graffiti. One night their paths combine and soon Marie must use her spiritual hideaway to help Sean and his father reconnect whilst also dealing with her own deep seated issues. Siddons has successfully created a mysterious and compelling slice of contemporary British film, beautifully traversing the usual stigmas associated with home-grown independent cinema. One of three micro-budget films to be made in Bristol under the iFeatures scheme, In the Dark Half is commendable for its richly textured cinematography and palpable ambiance of eerie mysticism, using the grim backdrop of British 1960s architecture and its rural surroundings to create a sinister and increasingly sombre atmosphere. Combine this confident visual architecture with an emotionally draining performance from Barden, who holds the audience’s attention throughout and you have a promising dramatic debut full of potential. However, unfortunately Siddons’ film is riddled with some unavoidable flaws, including numerous moments of stunted dialogue and a cliched finale, which sadly disappoints after such a poignant and promising set-up. A suburban ghost story of sorts which explores the nature of grief and adolescent depression, In the Dark Half tackles some lofty subject matter, yet never feels like its dark brooding sentiment is contrived. However, a weak script and the sense Siddons is attempting to punch above his budget leaves this intriguing film feeling like little more than a platform from which to launch both Siddons and Barden’s careers.